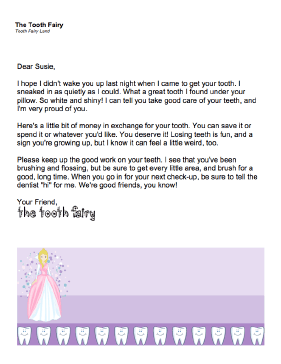 In this printable letter, the Tooth Fairy mentions the money she left and urges the child to keep up with brushing, flossing, and dental visits. I hope I didn't wake you up last night when I came to get your tooth. I sneaked in as quietly as I could. What a great tooth I found under your pillow. So white and shiny! I can tell you take good care of your teeth, and I'm very proud of you. Here's a little bit of money in exchange for your tooth. You can save it or spend it or whatever you'd like. You deserve it! Losing teeth is fun, and a sign you're growing up, but I know it can feel a little weird, too. Please keep up the good work on your teeth. I see that you've been brushing and flossing, but be sure to get every little area, and brush for a good, long time. When you go in for your next check-up, be sure to tell the dentist "hi" for me. We're good friends, you know!